Petrological and Geochemical Characteristics of the Samar Ophiolite Ultramafic Section: Implications on the Origins of the Ophiolites in Samar and Leyte Islands, Philippines. International Geology Review, 60 (4): 401-417, 12 March 2018. Fragments of fossil oceanic lithospheres are called ophiolites. Studies dealing with the petrological and geochemical characteristics of ultramafic sections of Philippine ophiolites are primarily interpreted in a regional perspective. It is believed that ophiolites exposed in the different parts of the Philippines were emplaced from various basins. They can be grouped into several belts based on age and geochemical signatures. The ophiolites in Samar and Leyte islands belong to the belt exposed along the easternmost margin of the Philippines. 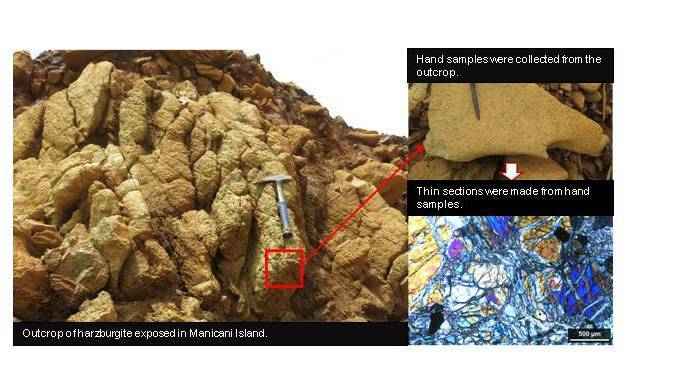 However, new petrological and geochemical data for Samar Ophiolite presented in this study revealed more information on its characteristics. Comparison of Samar Ophiolite and those exposed in Leyte show strong differences in their petrological and geochemical features. Active tectonic feature that may be considered as boundary separating the two islands is currently not observed. Possible explanations are proposed in this study for the differences of their petrological and geochemical signatures despite the absence of structures between the Samar and Leyte islands. Spiking Neural P Systems with Scheduled Synapses. IEEE Transactions on Nanobioscience, 16 (8): 792-801, December 2017. Spiking neural P systems (in short, SN P systems) are models of computation inspired by biological spiking neurons. SN P systems have neurons as spike processors which are placed on the nodes of a directed and static graph (the edges in the graph are the synapses). In this work, we introduce a variant called SN P systems with scheduled synapses (in short, SSN P systems). SSN P systems are inspired and motivated by the structural dynamism of biological synapses, while incorporating ideas from nonstatic (i.e. dynamic) graphs and networks. 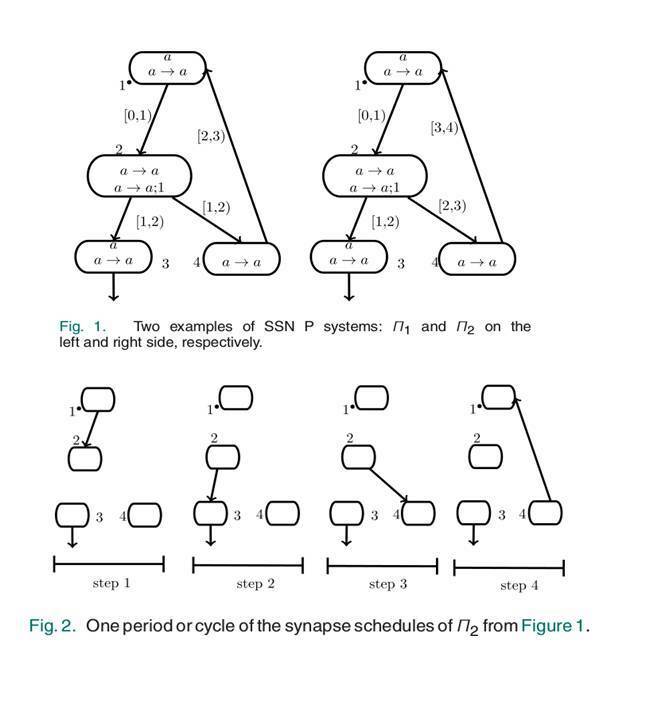 In particular, synapses in SSN P systems are available only at specific durations according to their schedules. The SSN P systems model is a response to the problem of introducing durations to synapses of SN P systems. Since SN P systems are in essence static graphs, it is natural to consider them for dynamic graphs also. We introduce local and global schedule types, also taking inspiration from the above mentioned sources. We prove that SSN P systems are computationally universal as number generators and acceptors for both schedule types, under a normal form (i.e. a simplifying set of restrictions). The introduction of synapse schedules for either schedule type proves useful in programming the system, despite restrictions in the normal form. “Simulating Evolutional Symport/Antiport by Evolution-Communication and Vice Versa in Tissue P Systems with Parallel Communication” in Membrane Computing. Marian Gheorghe, Grzegorz Rozenberg, Arto Salomaa and Claudio Zandron (editors). Cham, Switzerland: Springer, 2018. The Effect of Chitosan-Based Nanacomposite Coating on the Postharvest Life of Papaya (Carica papaya L.) Fruits. Philippine Agricultural Scientist, 100 (3): 233-242, September 2017. Particles of very small size (112 nanometers, nm) were prepared from chitosan and polyphosphate ions. These are called nanochitosan. These were used in the preparation of formulations for chitosan-based nanocomposite (Ch-NCh) films and coatings. Films prepared from formulations with varying nanochitosan formulations were examined by scanning electron microscopy (SEM). The Ch80NCh+Add, that containing 80% (v/v) nanochitosan, was the most compact and thinnest, followed by the film with 40% (v/v) nanochitosan (Ch40NCh+Add). The film, which did not contain nanochitosan (Ch+Add) was highly porous and the thickest. These coating formulations were applied on ‘Sinta’ papaya fruits to test their ability to delay ripening and extend the shelf life of the fruits. The fruits were stored at 14.6 oC and 79% relative humidity. The uncoated fruits limit of marketability was on the 7th day of storage, the Additives only (Add only) coated fruits on the 10th day while those coated with the Ch+Add formulation on the 14th day. At the end of the 26-day storage period, the Ch-NCh coated fruits were still marketable. The Ch-NCh coating formulations delayed peel color change, reduced disease incidence, shriveling and weight loss and preserved pulp firmness. The titratable acidity of the Ch80Nch+Add coated fruits peaked on the 19th day while those of the other fruits peaked on the 14th day. Total soluble solids (TSS) content of the fruits generally increased with storage but the Ch-NCh coated fruits had generally lower readings. The results showed that the chitosan-based nanocomposite coatings delayed the ripening of ‘Sinta’ papaya fruits. Cost-Effective Programming of Electric Demand in the University of the Philippines Diliman. Philippine Journal of Science, 146 (3): 205-221, September 2017. We analyze the electric energy usage and improve the electric demand programming of UP Diliman which maintains more than a hundred separate agreements for the sale of energy by Meralco to its academic buildings. Each agreement covers a unique power-meter account and obligates UP Diliman to pay a monthly electric demand charge that depends only on guaranteed minimum billing demand (GMBD) and not on actual electric demand. In 2010, the actual monthly demand in 34 of 109 accounts always stayed below their GMBD ratings. UP Diliman and Meralco reviewed the agreements and modified the GMBD ratings of 26 accounts to depend on maximum actual monthly electricity consumption in the previous billing year. The new GMBD ratings were first applied in March 2012 and the total electricity bill for the 26 accounts from March to September 2012 was approximately 30% less than what would have been paid using the original GMBD ratings for the same consumption, electricity cost and overhead charges. The 2013 bill of UP Diliman was 2.5% higher than that in 2012 while those in the 2012 and 2011 were higher by 7% and 2.8%, respectively. In contrast, relative consumption increased by 5.6%, 4% and -1.9% in 2013, 2012 and 2011, respectively. A consumption-based GMBD rating scheme is essential if the adoption of more efficient devices and energy-saving measures is to actually lower the electricity bill. Our work illustrates the benefits of accurate demand programming and meaningful public-private partnership in the operation of a public academic institution. “Classification of Codimension-One Bifurcations in a Symmetric Laser System” in Progress in Industrial Mathematics at ECMI 2016. Peregrina Quintela, Patricia Barral, Dolores Gomez, Francisco J. Pena, Jeronimo Rodriguez, Pilar Salgado and Miguel E. Vazquez-Mendez (editors). Cham, Switzerland: Springer, 2017. Assessment of Pesticide-Related Pollution and Occupational Health of Vegetable Farmers in Benguet Province, Philippines. Journal of Health and Pollution, 7 (16): 49-57, 1 December 2017. Are we able to protect our farmers who are the producers of the food we eat? Oftentimes, the health of our aqricultural farmers is not given much attention notwithstanding the fact that their health is closely linked with their productivity. The present study demonstrated frequent and significant duration of pesticide use among farmers in Benguet province, Philippines. The occupational health conditions reported by the study subjects are associated with their pesticide use. . The results showed that pesticide exposure usually occurred during agricultural activities such as spray applications in the field (63.7%), mixing (38.4%), loading (34.1%) and field re-entry (9.7%). The most frequently used pesticides were Tamaron, Selecron, and Dithane. The mean duration of pesticide exposure was 14.23 years for males and 15.4 years for females. The longest used pesticide among males was Sumicidine (16.2 years), and Tamaron for females (18 years). In terms of amount used, the average was 147 ml per spray application for males and 65.5 ml for females. Exposure to pesticides was expressed in number of years and amount used per spray application, and the average exposure of males was 2,024.43 ml/years and 993.55 ml/years for females. Among farmers, 49% complained of being sick due to their work. Of those who became ill, a large percentage (69.8%) did not receive any medical attention. The most prevalent health symptoms were muscle pains (63.3%), muscle weakness (55%), and easy fatigability (52.4%). For the mini-mental state examination, abnormalities were found in 5.4% of males and 13.3% of females. The use of insecticides was associated with weakness, easy fatigability and weight loss. Dynamics of a Delayed Intraguild Predation Model with Harvesting. AIP Conference Proceedings, 1937: 020006, 8 pages, 6 March 2018. Stability and Bifurcation Analysis of Three-Species Predator-Prey Model with Non-Monotonic Delayed Predator Response. AIP Conference Proceedings, 1937: 020006, 8 pages, 6 March 2018. We consider a delayed three-species predator-prey model with non-monotonic functional response where two predator populations feed on a single prey population. Response function in both predator populations includes a time delay which represents the gestation period of the predator populations. We call a positive equilibrium solution of the form ES ∗ = (x∗ , y∗ , y∗ ) as a symmetric equilibrium. The goal of this research is to determine the effects of the difference in gestation periods of predator populations to the local dynamics of symmetric equilibria. Our results include conditions on the existence of equilibrium solutions, and stability and bifurcations of symmetric equilibria as the gestation periods of predator populations are varied. A numerical bifurcation analysis tool is also used to illustrate our results. Stability switch occurs at a Hopf bifurcation. Moreover, a branch of stable periodic solutions, obtained using numerical continuation, emerges from the Hopf bifurcation. This shows that the predator population with longer gestation period oscillates higher than the predator population with shorter gestation period. Cloning, Molecular Analysis, and Developmental Expression of 3 Oleosin cDNA Isoforms in Coconut (Cocos nucifera L.). Journal of Horticultural Science and Biotechnology, 93 (3): 255-263, 4 May 2018. Figure 1. 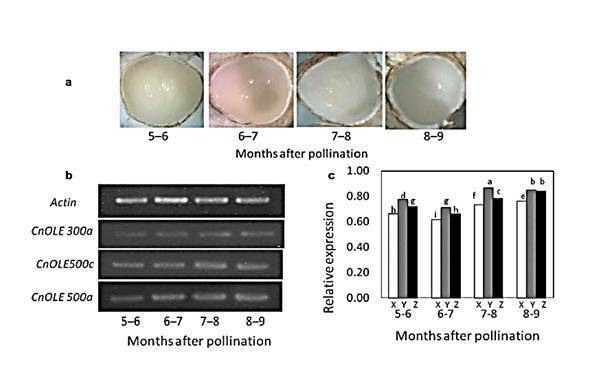 Coconut endosperm tissue at 5–6, 6–7, 7–8, and 8–9 months after pollination (Panel a). Expression of transcripts of the 3 isoforms of the oleosin gene (CnOLE300a, CnOLE500c, and CnOLE500a; X, Y, and Z, respectively in Panel c) in coconut endosperm at 5–6, 6–7, 7–8, and 8–9 months after pollination. The actin gene was the internal control (Panel b). Relative levels of expression of each isoform of coconut oleosin gene relative to the level of expression of the actin gene (Panel c). Figure 2. Oleosin protein accumulation at different stages of coconut endosperm development as shown by immunoblotting oleosins with polyclonal antibodies to total oleosins (Panel a); oil body proteins stained with Coomassie Brilliant blue (Panel b); the relative accumulation of oleosins as a ratio of their level at the most mature stage (Panel c). The coconut oil is stored in the oil bodies found in the coconut meat or endosperm. The oil bodies contain proteins called oleosins that stabilize their structure. This study reports the complete complementary DNA (cDNA) sequences of 3 genes for 3 isoforms of the coconut oleosin termed CnOLE500a, CnOLE500c, and CnOLE300a with 396, 375, and 381 nucleotides, respectively. Their predicted amino acid sequences were 131, 124, and 126 residues in length, respectively, with molecular weights of 13,787, 12,982, and 12,988 Daltons, respectively. The complete CnOLE500a cDNA sequence had 83.1% similarity with that of CnOLE500c, while CnOLE300a cDNA had only 50.7% and 46.5% similarity with CnOLE500a and CnOLE500c, respectively. Oleosins are characterized into two classes: 1) the high molecular weight, H-class which contain an 18 amino acid insertion equivalent to 2 kDa, and 2) the low molecular weight, L-class, which lacks the insertion. The three coconut oleosins belong to the L-class because they do not have the 18 amino acid insertion. However, phylogenetic analysis showed that CnOLE300a was more related to H-class oleosins from dicots. All 3 isoforms were highly expressed at all stages of coconut endosperm development. CnOLE500c exhibited 6% higher expression than CnOLE500a and 15% higher than CnOLE300a at all stages of coconut endosperm development. Young coconuts contained barely detectable oleosin proteins, but as the fruit matured, the amount of oleosins increased to 32 fold at 7-9 months. 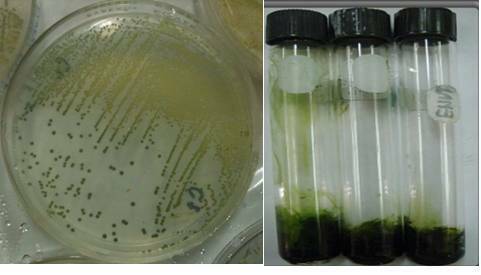 Fatty Acid Profile and Fuel-Derived Physico-Chemical Properties of Biodiesel Obtained from an Indigenous Green Microalga, Desmodesmus sp. (I-AU1), as Potential Source of Renewable Lipid and High Quality Biodiesel. Journal of Applied Phycology, 30 (1): 411–419, February 2018. Alternative sources of biodiesel such as microalgae are considered as potential renewable energy resources. This paper describes the possibility of using Desmodesmus sp. 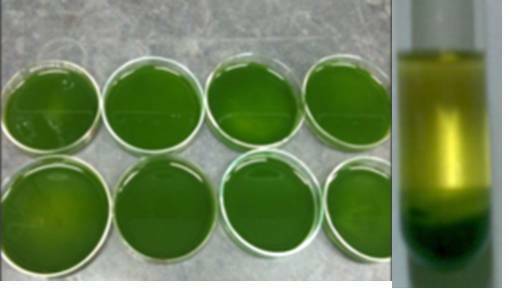 (I-AU1) for biodiesel production by evaluating its fatty acid profile distribution pattern and estimating the fuel-derived physical and chemical properties from fatty acid methyl esters (FAMEs) obtained from the trans-esterified microalgal oil. Under optimum growing conditions, Desmodesmus spp. (I- AU1) was able to produce and accumulate hydrocarbons up to 36% of its dry weight. Fatty acid profiling of the biodiesel obtained from Desmodesmus sp. (I- AU1) contained total saturated and monounsaturated fatty acid methyl esters of 56.66%, which is high compared to that of most of related studies. Fuel properties were determined by empirical equations and were found to be within the limits of biodiesel standards ASTM D6751 (American) and EN 14214 (European). Hence, Desmodesmus sp. (I-AU1) has potential as a feedstock for the production of quality biodiesel. The Subspaces Spanned by Householder Vectors Associated with an Orthogonal or a Symplectic Matrix. Linear Algebra and its Applications, 546: 37-49, 1 June 2018. It is known that every orthogonal or symplectic complex matrix can be written as a product of (orthogonal or symplectic) Householder matrices. A Householder matrix H has the property that the rank of H – I is one and is associated with what is called a Householder vector. Householder matrices appear prominently in matrix algorithms, which have applications in computer graphics, signal processing, and solutions of matrix equations. We establish relationships between the subspace U spanned by the Householder vectors of an orthogonal or a symplectic matrix Q, the image Im(Q-I) of Q-I, and the Jordan structure of Q.
Jose Florencio F. Lapeña Jr. External Auditory Canal Dimensions, Age, and Cerumen Retention or Impaction in Persons With Down Syndrome. Annals of Otology, Rhinology and Laryngology, 127 (4): 253-257, 1 April 2018. What is it about? What age and ear canal size are associated with a significantly higher likelihood of earwax problems in Down Syndrome (DS)? Persons with DS have smaller ear canals, and are prone to earwax problems that may lead to decreased hearing. It is recommended that persons with DS have ear check ups every 3 months until the age of 3 to allow sufficient widening of the ear canals and lessen ear wax problems, but this may not be easy for people in low and middle-income country settings, and those living in remote areas. We found that an ear canal diameter of 4mm or less, and age of 1 year or less, are associated with a significantly higher likelihood of ear wax problems, and attention should be particularly focused on these children by parents, caregivers, and healthcare providers.